I found this recipe in one of my vintage cookbooks. It looked good so I had to try it. Cook your pasta according to package direction, rinse in cold water and drain well. If using fresh broccoli, cut into one inch pieces and boil in salted water for about 7-9 minutes. If using frozen broccoli cook according to manufactures directions. Combine all ingredients and chill for at least 4 hours before serving. If desired, served over lettuce and top with Parmesan cheese. 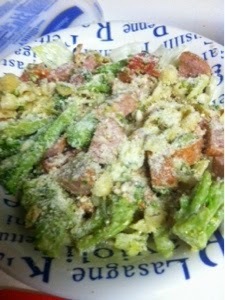 This sounds tasty :) we love pasta here..
We would just love your Bratwurst Pasta dish. Thanks so much for sharing your post with Full Plate Thursday. Hope you are having a great day and come back soon!